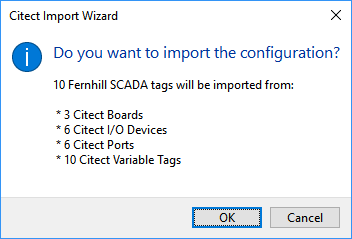 The Citect Import Wizard imports tags from a Citect project into Fernhill SCADA. Information: The Citect Import Wizard will provide best effort to import the Citect Project into Fernhill SCADA. Some features, for example BYTE tags, are not currently supported in Fernhill SCADA. 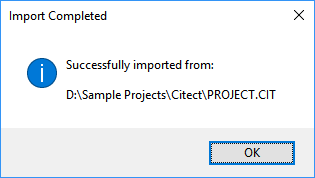 After importing a Citect project, please read the Import Report. The Import Report lists the feature(s) that were not transferred. Browse to and select the appropriate Citect.ini file. The Citect Import Wizard will open the Import Report providing a summary of what was imported from the project.